Diane Mott Davidson is the author of seventeen bestselling mysteries featuring caterer/sleuth Goldy Schulz, a woman who took the lemon that life had given her and made not just lemonade but Lemon Chicken, Lemon Bars, Lemon Cookies and Lemon Meringue Pie. Each Goldy novel includes recipes for scrumptious dishes from the adored characters kitchen. Now, Davidson has collected these treasured recipes and some brand-new dishes in one volume for the first time. Here are recipes for Appetizers and Soups, Eggs and Cheese, Salads and Starches, Meat, Poultry, and Fish, Breads, Desserts, and finally Low-Carb Recipes (how Davidson lost thirty pounds and kept them off). Most of the dishes came from playing around with dishes tasted in restaurants. Others are family favorites, some came from friends, and a few are happy accidents. At last, fans can enjoy delicious fare such as Bacon-Wrapped Artichokes with Dijon Cream Sauce, Diamond Lovers Hot Crab Dip, Sweethearts Swedish Meatballs in Burgundy Sauce, Andrs Coq au Vin, Ice-Capped Gingersnaps, Damson-in-Distress Plum Tart, and Dads Bread. Part memoir, part writing manual, part cookbook, Goldys Kitchen Cookbook combines the authors gift for storytelling with her skills in the kitchen. She introduces the recipes with stories about how she came to create them, anecdotes from her experiences as a writer and home cook, and includes her joy at receiving a fan letter from the legendary French Chef herself, Julia Child. 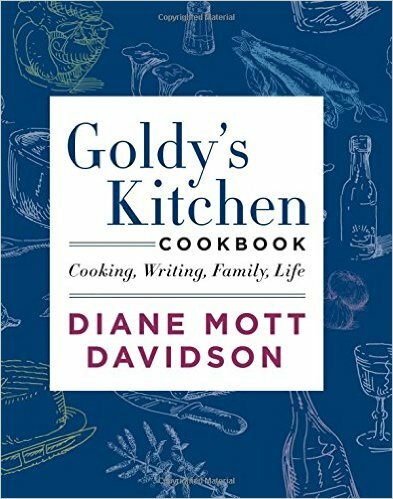 Full of irresistible food, Goldys Kitchen Cookbook is a must-have book for Davidson fans, food lovers, and cooks everywhere.